BOGO Yucatan Guacamole Coupon & Pot Of Guac Coupon Contest! Posted on Yucatan Guacamole and Dips facebook page: It’s here! 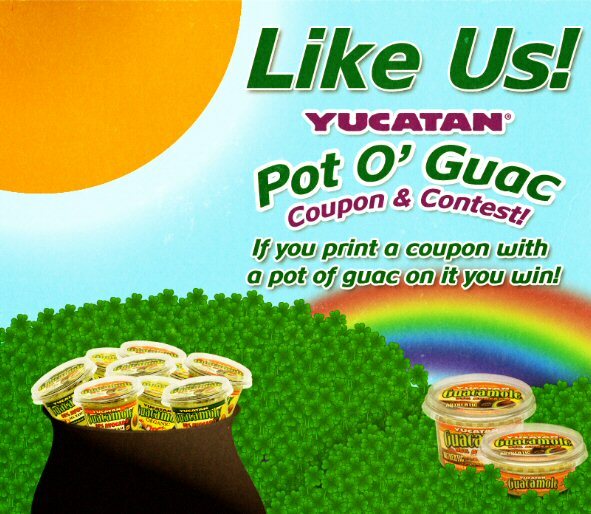 Our Pot of Guac coupon contest starts NOW! If your coupon has a Pot of Gold on it, then we’ll send you a Guac Party Kit! Click on our COUPONS tab to get started and Happy couponing everyone! Click here to like Yucatan Guacamole and Dips and get your coupon.